Hello, friends! For those of you who have visited me the past three days for the Paper Sweeties New Release Party, I thank you so very much. I hope you've thoroughly enjoyed all the fun and inspiration this sweet new I'm So Proud of You Stamp Set has brought us. This sweet new stamp set, along with all of Paper Sweeties fabulous products, are available now in the Paper Sweeties Shop. But before we wrap things up with this month's New Release Party, I wanted to share one last card to inspire your creativity. There are just SO many different things you can do with this sweet new stamp set, so I thought I'd explore another idea. 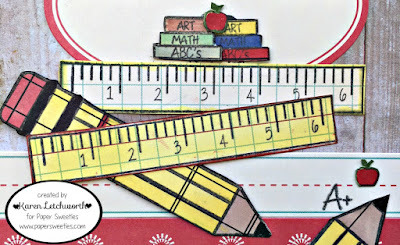 I used a wood-grain patterned paper as my base, and then added a piece of October Afternoon patterned paper, border sticker, ruler sticker, and journalling sticker. 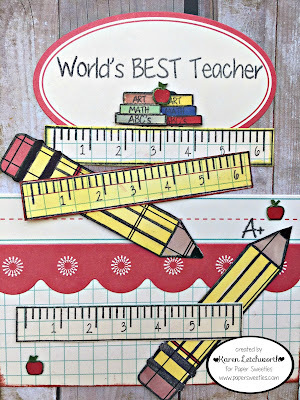 I stamped the sentiments (World's Best Teacher, A+), stack of books (two), apples (three), ruler (three) and pencils (two) from the new I'm So Proud of You Stamp Set. I simply placed the rulers and pencils here and there to represent the mess most usually found on a teacher's desk. I know just who I'm sending this card to. Any guesses? Even if your kids are grown now, like mine are, this is still a fun stamp set to own because you can encourage those in your life who teach, and all those little ones you know and love who could use a little extra encouragement during back-to-school time, or even throughout the year when they need a little pick-me-up and words of encouragement. That's the fun of making cards...being able to send them out to others and being able to bless and encourage others with our cards. Here's the hop list of all my talented teammates who have created something inspiring for you today using this sweet new I'm So Proud of You stamp set. I hope you will stop by and leave them some love. You're sure to thoroughly enjoy everything you see along the way. These are some truly talented and creative gals...to say the least. Thanks again for sharing the Paper Sweeties New Release with us. Stamping Sensations Challenge Blog - Something Beginning With B - I stamped all my images and sentiments with a darling new stamp set from Paper Sweeties (details above), and my B word is BOOKS. Time for the kids to hit the books again as they say. This is super cute. Love this new stamp set and all the fun things you've done with it. I'll have to go check out all the other projects. 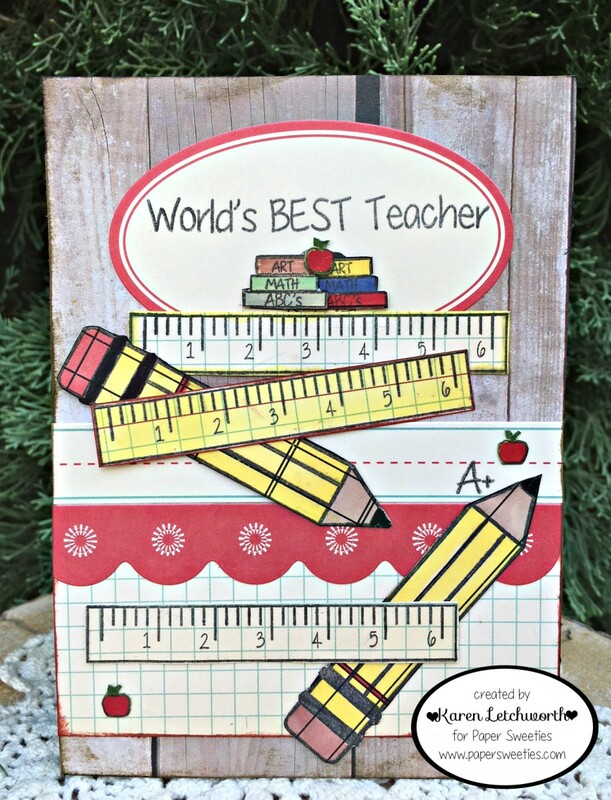 Another wonderful card Karen - a great one for a teacher at any level of the education spectrum. WHat a super card, I am sure the teacher will be thrilled to receive it, many thanks for joining in with our 'I Spy' theme at Stamping Sensations challenge. Super duper cute card, Karen! Love how you put all the elements together! This is gorgeous Karen...Love the ribbons and flowers. 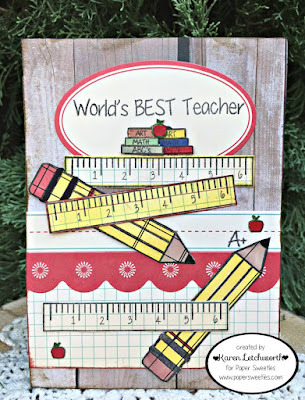 Beautiful card for teacher -so many wonderful elements that I keep looking back!